Spices and herbs are central to great cooking. And having lots of them is typical to busy kitchens. In fact, anyone who loves cooking has a decent collection of spice jars in their kitchen. Nothing is as annoying as being unable to find that bottle of dried oregano on your restaurant-bought pizza. This is where the best spice rack comes into play. Spice racks will make your work much easier since you will not have comb through kitchen cabinets to find the specific bottle you need. A top-quality rack can keep your jars well-organized, easy to find and store, and make proper use of otherwise misspent space in your kitchen. Some spice racks are so beautiful that they can enhance the decor of your kitchen while others are meant to tuck away into the cabinets. Regardless of the type you choose, you won’t have to gamble to find that jar of cinnamon. 2.4 Are Spices Included With The Spice Rack? 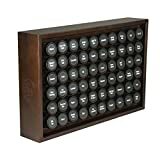 This spice organizer is a perfect choice if you have too many spices to deal with. 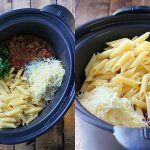 With a capacity to hold 30 full-size or 60 half-size spice bottles at a time, you will not have any bottles lingering around to clutter your kitchen counter. Its design allows you to find the spice you desire in just seconds. It features drawers that pull out and lower to give you the chance to see all the bottles each drawer in an instance. Once you find the bottle you need, simply side the flip-down drawer back for compact and neat storage. The drawers are designed to fit both square and round spice bottles. Even better, YouCopia has included removable labels to help you identify each spice with speed. The tags are 96 in number. Of this number 48 labels are blank while the remainder is labeled with the names of the most commonly used spices. The blank labels are ideal for blends of spices or unusual spices you might be having. The organizer requires no installation or mounting. Just leave it on the counter or shelf or slide it in the cabinet. It also has non-skid feet to hold the organizer in place. This unit measures 8 ¾ inches x 10 7/8 inches x 12 ¾ inches wide to fit most standard cabinets. However, YouCopia offers other spice capacities and sizes to suit your needs. The Deco brothers provide you with a beautifully designed decorative wall spice rack. The DecoBros 3 Tier Wall Mounted Spice Rack will take your breath away because of its attractive design capable of taking your kitchen to the next level. This multi-purpose rack is ideal for spice bottles, jelly jars, and even polish bottles. It features durable and robust steel-wire construction with a beautiful bronze finish. Designed to mount on the wall easily, the rack comes with all its mounting hardware including screws and wall anchors. The rack has four holes, but DecoBros includes 5 short screws to allow you to mount inside a pantry door. The package also includes 5 long screws featuring 5 plastic anchors if you wish to install the rack on sheetrock. You’ll require a few minutes to mount the rack. Its 3 tier design offers you enough space to keep many spice bottles for easy identification. Measuring 3.5 inches x 11 inches x 17.5 inches and weighing just 1.48 pounds, the organizer is easy to mount. Each tier is 3.5 inches deep and therefore capable of holding jars up to 3 inches in diameter. A 6-inch bottle can fit but with some difficulty. It is not clear how many standard jars or bottles the rack can hold at a time, but you can be sure it will take up quite a number. Buying spices in bulk can save you a lot of money. Many common spices are also available in repackaged versions inside plastic pouches. Regardless of your choice, you need to find a reliable way to organize them once you bring them home. The DecoBros Spice Rack Stand offers you the opportunity to organize the spices you buy in bulk. This model was designed specifically to hold round spice bottles. It is a combination package that includes the spice rack, 18 spice bottles as well as 48 spice labels. DecoBros has three tiers engineered to hold 6 standard bottles. The shapes of the holders are specific for the included bottles so that each bottle fits perfectly. Each spice bottle is made of clear glass to give you a glimpse of the spice while the lid is shiny. The clear glass lets you to effortlessly see the contents of the bottle for easy spice identification. Each of the containers also comes with a removable plastic cap studded with tiny holes. The cap works as a spice shaker for easy use. Removing the shiny lid reveals the removable plastic cap. Like most DecoBros spice holders, this model features sturdy steel-wire construction with chrome finish. Its compact stand-alone design will save you counter or cabinet space. The unit measures 3 inches L x 4 ¼ inches W x 8 ¼ inches H while each bottle measures 1-3/4” by 3-3/4”. If you prefer high-end spice rack, then look no further than the AllSpice Wooden Spice rack. It is a valuable kitchen appliance capable of elevating your cooking experience with an effortlessly accessible palette of your lovely spices. With the capability to hold up to 60 full-size spice bottles, you finally have a beautiful way to organize your entire spice collection in a single place. This wooden spice creates an elegant display in your kitchen while at the same time freeing up central space. Its narrow profile uses a paltry 4.75 inches of your kitchen counter space from your wall. This will grant you plenty of room for all your other cooking activities and appliances. The wooden construction is strong and durable, capable of standing up to frequent use. AllSpice offers you a chance to choose from 280 pre-printed, water-resistant labels that are black with easy-to-read white fonts. The pre-printed labels cover almost all known spices in the market including both traditional and exotic spices. There are also blank labels to customize. It comes with large full-sized 4 oz glass jars closed with durable plastic caps. The glass walls allow you to identify the spice you need quickly. You can customize each jar with the appropriate shaker for every kind of spice. There three types of shakers to choose from – large hole, small hole, and AllSpice spoon-scraper top. The rack features foam rubber glider feet to protect the wooden frame from water damage and scratches. Vertical Spice Cabinet Mounted Spice rack boasts of a unique patented design. It features a medium size that allows you to organize 30 full-size or 60-small size spice jars at a time. Its unique design allows you to bring back the raw easily to the front to offer you easy access. It has three drawers with each measuring 2.10 inches wide x 10.05 inches in length. Each drawer rides on a sturdy steel ball-bearing slide making it easy for you to access the spice bottle you need. The back and front sides of the rack feature clear acrylic or Plexiglas. The base and the drawers are made of PolyTuf HDPE material which is sturdy, easy to clean and very durable. Each band, on the other hand, features polyester fiber that surrounds the elastic core. As you can see, all these materials are strong allowing you to enjoy an organized kitchen for years. Vertical Spice Cabinet-Mounted rack is very easy to install. You can do it yourself. All you will need is the appropriate screwdriver. When you buy the unit, your package will arrive pre-assembled with screws for mounting. The sidebands are flexible while the steel ball-bearings slide freely. All these features together with clear panels make access to the containers very easy. There are customizable sizes to meet your needs. MyGift is a well-known manufacturer when it comes to making home and kitchen products. 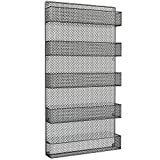 Their Country Rustic Chicken Wire Spicer rack is one of the best spice organizers currently in the market. This wall mounted rack feature 4-tier design that gives you enough room to store all your favorite spices. The design is narrow and compact allowing you to install it by just hanging it on an appropriate surface. You can attach the organizer on your pantry door, on the sides of a cupboard or the wall of your kitchen. It measures 17 inches W X 20.75 inches H X 2.25 inches and weighs 3lbs. Not only will it help you organize the kitchen, but it will also enhance your kitchen’s aesthetics. Each level of the 4-tier rack is capable of accommodating lots of standard-size spice jars, bottles as well as other kitchen products. Keep in mind that spice jars are not included in the package. The unit is straightforward to install. Just mount it with the included screws. You can find installation information on the manual provided within the box. Another great feature you will love is the rack’s rustic country appeal. Such finish will provide the perfect complement to any majority of French country, country rustic, or even farmhouse design. The unit is available in three different colors to choose from including gray, black and white. Choose the color that fits your furniture theme. Do you find it overwhelming and challenging to trace the spice you need each time you are cooking because spice bottles seem to be everywhere? 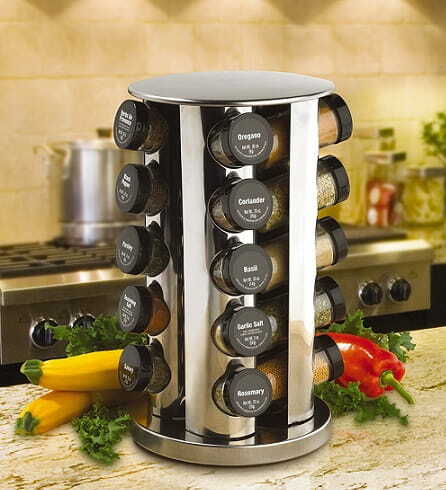 If that’s the case, then you can benefit from this 5-tier spice organizer from Spice Racks. The wall-mounted rack is spacious and high-quality allowing you to store all your spices within the rich of your arm. The rack’s space-saving design makes it ideal installation on your kitchen wall, cabinet or pantry door. You can keep your spices organized for easy identification and to remove all the clutter from your kitchen. 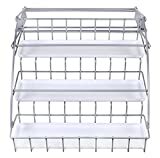 Its 5 shelves are designed to accommodate standard-size spice bottles and containers. The vertical orientation of the shelves makes accessibility very easy. You will also love the rustic design of the organizer. Not only is the rustic wire construction elegant adding beauty to your kitchen, but it also strong and long-lasting. Although strong and durable, the rack is extremely lightweight. The rack measures 26.7” (H) x 17.3” (L) x 3.7” (W) and weighs just under 3 lbs which is light enough for effortless installation. There is no need to ask for the services of a professional because the installation of the rack is a snap. It comes with mounting screws as well as setup instructions to offer you guidance. If you choose to buy this product, Home-Complete will provide you with a satisfaction guarantee. 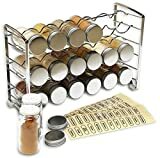 This wonderfully designed spice organizer incorporates 3 storage levels that let you store all your spice bottles and jars neatly and correctly. 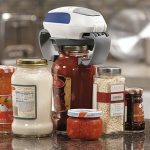 The aim is to make these cooking accessories easy to access and thus saves you the time of cooking. 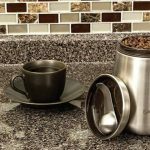 It features a lovely design that will enhance the décor of your kitchen while at the same time get rid of the annoying clutters on your kitchen countertop. 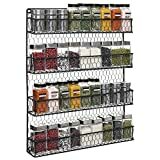 The DecoBros 3-Tier Wall Mounted spice organizer is made from tough, durable steel wire with an attractive chrome finish. You can mount it on the pantry door, in the cabinet or on the kitchen well. It will look great in any of these places. The organizer is very easy to mount, and the package comes with the necessary mounting hardware. The lightweight and compact-sized spice rack measure 3.5 inches x 11 inches x 17 inches. The 3.5 inches depth is capable of holding up to 2-7/8 inch diameter jars. Each tier can hold five square full-size spice bottles or ten square half-size bottles. That means the organizer allows you to store up to 15 large size bottles or 30 half-size bottles. Although sold as a spice rack, this multipurpose organizer can hold other things including perfumes. This means you can buy one for your kitchen and the other for your master suite. It will look as elegant in your bedroom as it does in your kitchen. For decades, Rubbermaid has managed to stay relevant in the market due to their innovative, high-quality products specifically designed to simplify your life. 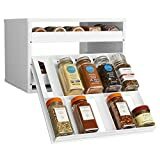 The Rubbermaid Pull-Down Spice Rack is one of their products specifically designed to help you with your kitchen organization. It offers you a perfect way to keep your pantry organized. The rack easily mounts to your cabinet shelving. When ready to use it, only pull down the rack to display your spice bottles at your eye level. The organizer’s design features a white plastic try to let you keep your bottles secure. Besides, there are wide spaced wires to help improve visibility. The rack is capable of holding 18 full-size spice bottles. Installation is straightforward and simple to install. You can mount it on any wooden shelving whether in your pantry or kitchen cabinet. All the necessary mounting hardware comes with the package including simple instructions on how to carry out the installation. When it gets dirty, hand washing is the recommended method as the washing machine could damage parts. Although spacious, the Rubbermaid Pull-Down spice organizer is lightweight for easy handling. It weighs just 2.9 pounds. It measures 10.6 inches x 14.2 inches x 8.4 inches. The compact and elegant design will give your kitchen a beautiful makeover. Even if your cabinet is 11 inches deep, the organizer can still fit with little space to spare. 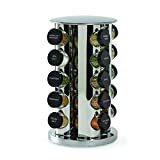 The last but not least product in our top 10 best spice rack reviews is the 20-Jar Revolving Countertop Spice Tower from Kamenstein. It qualifies as the best spice rack with spices. If you buy it today, you will be eligible for 5 years of refill of all the spices that come with the rack. The Kamenstein Spice tower comes with twenty pre-filled glass jars. While the spices can vary widely, the common names include basil, parsley, thyme, garlic salt, marjoram, oregano, rosemary, coriander and many more. However, you have to register for free refills. This feature makes the spice tower one of the most affordable spice racks currently in the market. Each of the spice jars is equipped with sifter lids that are ideal for light seasoning. Such tops are also removable to allow you to take measurements if necessary. A unique feature of this spice rack that you will not see with other brands is the ability to revolve. This gives you easy access to the spice you need. The tower design makes it compact and easy to store. For your safety, Kamenstein fills all the spices and jars and then seals them for freshness in their FDA-approved and monitor facility situated in Winchendon, MA, U.S.A. The unit measures 14.2 inches x 11.3 inches x 8.2 inches and weighs 8.55 pounds. It may be slightly heavier than other models in this review, but such weight is not so bad for countertop design. With so many brands, models and types of spice racks currently available in the market, it might be difficult to settle on a particular one. We have already provided you with a review list of ten of the best spice racks you can even find in the market. 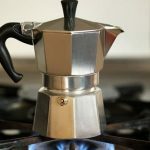 If you have not seen one that suits your needs, then you can benefit you can benefit from this buying guide. There are so many types of spice racks to choose. Discussing each in detail is beyond the scope of this article. However, we will briefly mention the most common ones. The wall-mounted spice rack is ideal for individuals with space issues. Its design lets you to fix it on the wall of the kitchen where you can easily reach for them. This way, you’ll free useful counter space. Drawer insert spice rack is designed to fit inside your drawer. It is a wonderful choice if you do not want to mount anything on your wall or lay it on your counter or you want to keep the spices out of view. Cabinet door spice rack attaches to the inside door of your kitchen cabinets. This style will save you a lot of counters and wall space, but it will keep the spice rack out of view making it less glamorous. Magnetic board spice racks, on the other hand, are available in both wall mounted and countertop models. The jars pair with their bases which intern have magnetic backs. You can actually stick them on any magnetic surface at your disposal. Pull-down spice racks are among the best because they allow you to keep your spices out of view but easily access them when you need to use. Most models allow you to label the spices for easy identification. Standalone spice racks are also very common. You’ll find them in many homes and even professional kitchens. They vary in design but all tend to feature some form of feet at their bases to provide stability. At the same time, such feet protect the countertop from damage from the weight of the rack. The types stated above are among the common ones. However, other types do exist that are worth mentioning. These include auto-dispense, countertop and built-in spice racks. Yours is to choose the kind with will meet your style. The most typical materials used to make spice racks include metal, plastic, and wood. The commonest metal used is rustic steel with different kinds of finishes. Steel is strong and capable of holding numerous spice jars without bending under weight. Wood is another excellent material for making kitchen accessory. The best type of wood should be furniture-type as such will match well with other furniture in the house giving your kitchen an aesthetic makeover. Plastic is seldom used, but racks made of it are also beautiful and sturdy. How many spice bottles can a spice rack organize? Well, these gadgets come in a wide variety of sizes that can hold just a few jars to tens of them. The choice of size and capacity to buy should depend on your own desires. 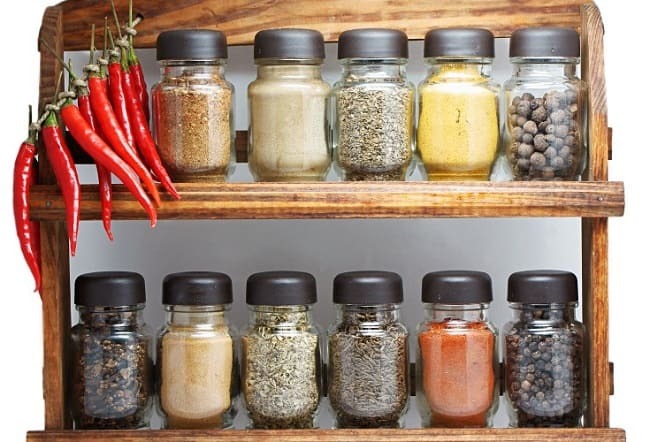 The bottom line is that the rack should be able to organize all the spice bottles you have in your kitchen to make your work easier and keep your kitchen neater. Are Spices Included With The Spice Rack? Some brands make spice racks that come with filled bottles of labeled spice. This is great because you will not have to go about buying every spice you need. In most cases, they come with the most familiar spices people use at home. The fact that the spices are labeled makes it easy for you identify what you need. Great brands allow for a period of free refills on a single purchase making them prime choices for those who want to make some savings. Spice racks can range in price from as low as $10 to over $50. 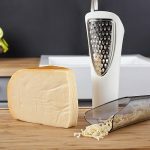 Such a simple kitchen tool should not be too expensive. This does not mean you go for cheap models that are poor quality. Find a way to match quality with price. Read what others buyers have to say about the spice rack of your interest and then check the amount of money you have set aside for the purchase. Generally, you will always get what you pay for but there are a few exceptions. You can take advantage of discounts and other promotions that guarantee you price cut. You can get lucky if you do some little research. Therefore, make an informed choice. Q: What is a spice rack? Ans: It can be defined as a tool that helps with kitchen organization by holding spice bottles securely. Most are designed to take up many jars at a time and offer a mechanism of identification so you can easily reach the spice of interest. Ans: Yes, it can. Imagine having jars of spices everywhere in your kitchen. Not only will your kitchen look cluttered but also untidy. Besides, you will have an enormous task trying to find a single bottle of the spice you need to use at a time. A spice organizer helps you put all the spices in one place complete with identification so that you can find them fast and efficiently. Q: What are the best spice rack brands? Ans: Although many brands have ventured into producing this important organizer, only a few have stood the test of time because of the quality of their models. The best brands according to many are DecoBros, YouCopia, MyGift, Kamenstein, and AllSpice among others. Compare the models from the popular brands to help you make a smart choice. 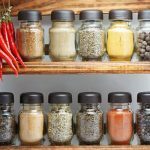 Q: Where can I buy the best spice organizer? Ans: While you can certainly get a spice rack to buy in a local store, you lack a variety to make comparisons. Besides, you may miss out of some benefits of buying the product online such discounts. The best places you can find variety and competitive prices are online retail shops such as Amazon. It is now clear and a true that nothing should stop you from buying the best spice rack. You do not have to go on wasting precious time every time you want to use that bottle of oregano because spice jars are everywhere. 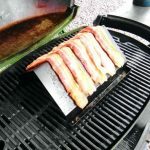 Choose one from the top 10 best spice racks we have reviewed or use the valuable buying guide to make your own choice. Either way, you will enjoy the benefits of a well-organized kitchen and quick access to your favorite spices. 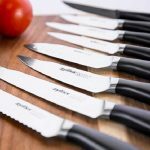 Great cooks and even chefs from all over the world have recommended many of the models in our review. You too will love them.